Competition Dining series was started right here in North Carolina seven years ago in Blowing Rock by Jimmy Crippen, owner of Crippen’s Country Inn & Restaurant there. In 2012, the event grew to include not only Blowing Rock’s “Fire on the Rock”, but also Wilmington: “Fire on the Dock”, “Fire in the Triangle” competition between Raleigh-Durham-Chapel Hill chefs, and also “Fire in the Triad”, held in Greensboro (this year in Winston-Salem). This year they also expanded to South Carolina with the addition of Greenville, SC. The event builds excitement for local restaurants, local food, and “stretches” chefs as their culinary skills and creativity are challenged. We had a wonderful time at Fire in the Triad in recent years and our MyWinston-Salem crew will be back for more each year. This year this fun dining event was held May 22, 23 and 25, 2016, in Winston-Salem at the Benton Convention Center (301 West 5th Street). The exciting lineup of local Winston-Salem restaurants last year included Noble’s Grille, The Phoenix, Undercurrent, Gia, Meridian, River Birch Lodge, Graze, Perky’s Bistro and Giannos. To follow the event, buy your ticket or to read more information, visit www.competitiondining.com. 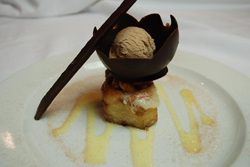 This year this fun dining event will be held April 22-June 2, 2014, in Greensboro, NC at the Empire Room in Elm Street Center (203 South Elm Street). 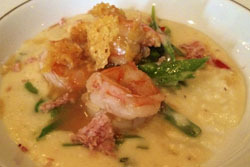 The lineup of local Winston-Salem restaurants is very exciting and includes Quiet Pint Tavern, Meridian, Spring House, Artisan, New Town Bistro, Grace, The District, and River Birch Lodge. After being invited to Fire in the Triad by one of the co-founders of My Winston-Salem.com, the hubby and I quickly researched this awesome NC based competition cooking event. After perusing the website, and regaining control of our salivary glands, there was little doubt as to where we would be at 7:30 on Tuesday night, June 18, 2013. What is Fire in the Triad? We arrived in Greensboro, at the Empire Room, for the Semi-final round featuring the fearless chefs from local establishments. The tables were surrounded by video monitors as part of the high-tech, high energy dining experience. This exciting, blind tasting match-up, aptly dubbed “The Battle of First Names” pitted Chef Greg John of the Greensboro Country Club against our own Chef John Bobby from Noble’s Grille in Winston-Salem. The secret ingredients, given to the competitors seven short hours prior, were revealed to us after a video montage of clues. This battle featured a duo of ingredients; Chapel Hill Creamery’s Calvander – a cheese comparable to Asiago and a flavorful raw honey from St. Dominic’s Honey. Throughout our three courses, the chefs seamlessly integrated these into carefully crafted dishes. 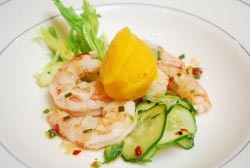 In the first round, the honey with fresh white peaches became a glaze for Chef John’s low country inspired shrimp dish with delightfully crispy snow peas. 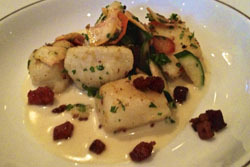 Chef Bobby wove the cheese into a rich beer cream with gnocchi, highlighted with baby veggies in a honey gastrique. We were in love – unfortunately, with both. a heartier plate by Chef John. 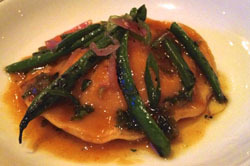 With honey braised pork, a Calvander fondue and spätzle –we quickly filled up. The lighter, brighter dish by Chef Bobby (cheese raviolio bathed with a honey chimichurri) definitely took the round for us. Dessert sealed the deal– although I was in the minority at our table. Chef John’s chocolate extravaganza became a bit of a soupy mess and I found the texture of the curdled cheese off-putting in the sauce. The pear torte, from Chef Bobby’s camp, delicately melded the ingredients and then hit it out of the park with a shortbread-like pistachio crumble I could have eaten a bag of! 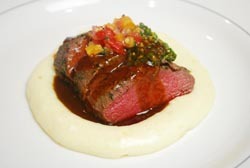 The competition was fierce, with Chef Bobby of Noble’s Grille winning by a narrow margin and advancing to the finals. We had a blast, and will definitely be back for more Fire events as soon as possible! If you are into delicious food, lively competition and a wonderful night of culinary creativity showcasing NC’s finest ingredients and Chefs, we highly recommend this series. [Note: No tomatoes or Scuppernongs were thrown, flung or harmed during the competition, you know, other than being eaten.] The goal of the competition is to “celebrate local North Carolina products and agriculture and to showcase the culinary ingenuity and talent across our state.” The “Iron Chef”-style event utilizes primarily North Carolina produce, meats and other products, as the North Carolina Department of Agriculture is a sponsor of the event. Chefs find out their “secret” ingredient the day of the competition, and with no aide (even their cell phones are confiscated the day of the event), develop recipes and a menu to serve the approximately 200 guests that very evening (you can even buy tickets to be among the judging eaters). The “secret” North Carolina ingredient for the battle between Winston-Salem’s own Chef John Milner of Milner’s American Southern and Chef Taylor Brett of Bin 33 on Tuesday, August 28th, was two-fold: Tomatoes and Scuppernog grapes — our State Fruit! Who knew? Both chefs demonstrated amazing culinary ability and creativity during “Battle Tomato-Scuppernong,” creating dishes like Milner’s jalapeño Carolina shrimp with golden tomato sorbet; his smoked, roasted Ashley Farms pheasant with tomato-feta bread pudding (my favorite accompaniment of the evening), and juniper-scuppernog pheasant jus; and herb-roasted lamb loin with gold potato-goat cheese fondue, pistachio mint pesto, and Cherokee Purple espagnole sauce. This evening’s battle was particularly meat heavy, starting with the Carolina shrimp, followed by two dishes of pheasant and then two dishes of lamb. (I felt a little sorry for the vegetarians in the room.) Most of the crowd was pining for something light and sweet for dessert, but Chef Taylor Brett’s goat cheese and green onion tart with feta gelato received mixed reviews. The tart was too savory for most to consider it a dessert, and, let’s face it, feta gelato is a risky move, even with the candied mint and blackberry sauce. As a feta fan, I thought the feta gelato was wonderful and boldly creative, and it was therefore my favorite taste of the evening. Both competitors proved to be fantastically talented chefs, but Chef John Tidwell Milner of Milner’s American Southern brought home Winston-Salem’s first win of the event, with Chef Taylor Brett of Bin 33 trailing by only three points. Chef Milner’s brother Buddy served on his team as well, and the Milners had a large following at the event, which showed by the loud applause, standing ovations and whoops from the crowd. Milner will go on to compete against Chef Kristina Fuller of The Bistro on September 12, 2012, and will hopefully go on to win the $2,000 cash prize and the much-coveted “Red Chef’s Jacket” in honor of our city of Winston-Salem. Congrats Milners on a job well done! And bravo to all the chefs competing. This is no small challenge to undertake. Other Triad chefs and restaurants competing include: Chris Blackburn of Josephine’s, John Bobby of Noble’s Grille, Timothy Bocholis of Bistro B, Mark Grohman of Meridian, Timothy Grandinetti of Spring House Restaurant, Michael Harkenreader of Undercurrent, Leigh Hesling of Green Valley Grill, Janis Karathanas of Mozelle’s, George Neal of 1618 West, Jay Pierce of Lucky 32, Chris Russell of B. Christophers, Jonathan Wheeler of Southern Lights, and Jon Willis of Emerywood. Attend a Battle & Taste for Yourself! As of this writing, tickets are still available for the September 12th battle between Milner’s American Southern and The Bistro, as well as the semi-finals on September 19th. Tickets are $49 per person and can be purchased here. In honor of September 11, the secret ingredient was actually a trio of ingredients of the red, white and blue variety. Red apples, white milk (buttermilk to be more exact) and bleu cheese each had to be used in at least two of the three dishes served up by the two competing restaurants. And compete they did! Neck and neck with Undercurrent trailing Green Valley Grill right up until the last dish, the pièce de résistance was the sticky bun made with housemade challah dough and caramel bacon from Undercurrent to push them over the top for a come from behind win of less than 0.5%! It was a nail biter but, more importantly, the chef’s bites were some of the tastiest we have ever experienced. If this event comes back to the Triad next year (which we are sure it will after a sell out this year! ), you MUST get tickets. This event is not to be missed! Last night’s quarter-final featured PORK as the secret ingredient! 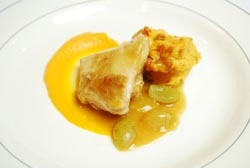 Chef John Milner of Miln’ers American Southern, and his team triumphed in their earlier Battle Tomato/Scuppernong and faced off against Chef Krissy Fuller of The Bistro at Adams Farm, who won Battle Poulet Rouge. Chef Milner will go on to compete against Chef Michael Harkenreader of Undercurrent restaurant on September 19th in the semi-finals. The secret ingredient for this semi-final was EGGS! Quail eggs, duck eggs, poulet rouge eggs and even ostrich eggs! 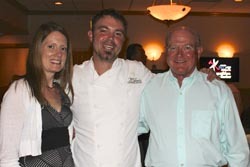 Chef George Neal showed he’s an “eggs-pert” at cooking with egg as he won the battle. Tonight was Battle NC Crab! Chef John Milner of Milner’s American Southern of Winston-Salem faced off in this semi-final agains Chef Michael Harkenreader of Undercurrent in Greensboro. Chef Harkenreader won this battle and will move to the finals next Tuesday, September 25th against Chef George Neal of 1618 West Seafood Grille. The final battle of Fire in the Triad was between Chef George Neal of 1618 West Seafood Grille and Chef Michael Harkenreader of Undercurrent. The secret ingredients of the night were North Carolina peanuts and beer! Chef Neal lead in each course, but his ultimate favorite of the evening was overwhelmingly his dessert of cinnamon roll with candied peanuts, in a chocolate bowl filled with chocolate peanut porter ice cream. And in case anyone was wondering how the popular votes were tabulated to determine the winner, we had the pleasure of sitting with the IT team behind the result tabulation, h.IT Solutions (HITS). These guys are true pros and were on top of every detail the entire night to ensure a seamless experience from farm to fork to winning chef! This was a great example of how technology can enable a great dining experience with new friends to meet, delicious food to enjoy and some healthy competition to boot. If you have questions about the scoring of this competition or any unique (or ordinary) technology needs, HIT is the local NC company to call. Just like the food, they over-delivered! Winners of the Fire on the Rock, Fire on the Dock, Fire in the Triangle and Fire in theTriad are coming together to compete for the Final Fire State Championship November 15, 16 and 17, 2012 in Raleigh, NC. On November 14th, Chef George C. Neal of 1618 West, of Greensboro, winner of the Fire in the Triad, will compete against Chef Michael Foreman of Bistro Roca, of Blowing Rock. The following night, winner of Fire on the Dock, Chef Andy Hopper of Chefs 105 in Morehead City, NC, will compete against Chef Ryan Payne, winner of Fire in the Triangle. Finally, the finalist from November 14th will compete against the winning chef from November 15th to determine the winner of the Final Fire State Championship. The events sold out the same day tickets were released.